The last decade has been a truly exciting one in cultural studies of sound, largely due to the generous and catalytic contributions of Jonathan Sterne. These include several significant articles, a strong intellectual and activist web presence, and a provocative genealogy of early sound reproduction and transmission entitled The Audible Past: Cultural Origins of Sound Reproduction. Despite Sterne’s commitment to the “interdisciplinary ferment” he describes in his introduction to the recently published Sound Studies Reader (2), the consolidation of a paradigmatic thought style founded on his example seems likely. Yet, Sterne’s signature ability to defamiliarize naturalized sociotechnological systems relies on a singularly non-paradigmatic approach layering multiple fields and disciplines with a broad assortment of theoretical traditions, literacies to which there are no “royal roads.” Particularized interdisciplinary formations like Sterne’s refract imitation, which may be part of the reason that critical sound studies has been able to remain for so long in the non-paradigmatic, pluralistic state that Jacques Attali celebrated in 1985 by making “a call to theoretical indiscipline, with an ear to sound matter as the herald of society” (Attali 5). Sterne’s encyclopedic familiarity with diverse and crowded theory worlds represents a serious contribution by itself. He traverses critical domains in sociology of technology and science, philosophy of science, disability studies, music studies, cultural studies, political economy, continental and occasionally analytic philosophy, information studies, and gender studies. Meanwhile, as digital mediation becomes a universally primary concern, his home discipline of critical communications studies stands poised to assume an increasingly crucial role in interdisciplinary discourse by providing pivotal understandings of technologically assisted socioeconomic change. Thus, Sterne’s example as a polymath of both theory and method is auspicious in its flexibility and strength. While in MP3 a small number of thinkers, including Heidegger, are read lightly and deployed for the most part as sources of descriptive vocabulary, very few of Sterne’s many disciplinary and philosophical alliances could be described as casual; his decision to cite the mid-20th century American neo-Marxists Baran and Sweezy is never explained, but this is atypical. Those ontological and phenomenological influences that he rarely mentions, such as Deleuze and Guattari, maintain a consistent presence legible to initiates and, of course, are inscribed in the bibliographies of Sterne’s books. Undeniably, however, the most salient and foundational elements of Sterne’s critical apparatus remain a co-constructivist view of society and technology grounded in Bourdieu’s contributions to social and cultural theory and in Foucauldian genealogical and archaeological method. Sterne’s work avoids any clichéd valence Foucault’s techniques may have acquired in less capable hands, as is evident in the force and elegance of MP3’s argument: “the conjuncture that gave rise to MP3s will retain a certain significance—as the moment when the dream of verisimilitude was publicly troubled, when perceptual processing washed over the digital landscape, and when an uneasy truce over the materiality of sound and music was spectacularly disturbed” (31). Political economy has become increasingly central in Sterne’s work, providing what may prove to be one of the most influential foci of MP3. Instead of locating the generation of value within processes of labor or consumption as traditionally understood, Sterne focuses on a less direct form of exploitation, one that utilizes limitations of the physiological structures of human perception during the consumption of temporal media. As Sterne explains in the first chapter, “Perceptual Technics,” research and development in communications technologies produces methods for regulating the transmission of potentially meaningful information by reducing its flow to meet minimum perceptual requirements. New levels of medium and format efficiency afforded by increasingly refined and standardized schematic conceptualizations of human perception correspond to opportunities for communications enterprises interested in market consolidation and expansion—and, in the digital era, for hackers and pirates. MP3 ends with a historicization of this development as one of many conditions of possibility determining contemporary ambiguities in intellectual property rights and in the ethics of digital piracy. Without a clear understanding of the relationships Sterne traces among perceptual coding in the MP3 protocol, the format’s ease of transmission and duplication, and the music file-sharing that has inspired so much Internet libertarianism, certain details of Sterne’s arguments may become ambiguous, especially for the many readers who will study single chapters rather than the entire book. Actually, however, what defies stable definition is the reality of contemporary economic indeterminacy necessarily preserved in Sterne’s careful avoidance of forced conclusions. Framed by a radical decontextualization of auditory perception and interpretation, Sterne’s discussion of subjectivity and technology in the context of "perceptual capital" adumbrates genealogical relationships between, for instance, objectified listening cyborg-subjects and the networked vivisected cats used in early cybernetics experiments. In addition, the widespread contemporary practice of online music file-sharing provides an opportunity to link emerging socioeconomic forms with older constellations of technologies and practices, including the ones excavated in such detail in The Audible Past (MP3 30). In this long tradition of research, communications reception devices “stand in for ears” in 20th century examples much as they did for the 19th century inventors of telephony and phonography (MP3 60). Unlike many postmodernists, Sterne does not celebrate the loss of the subject to statistical data manipulation (or to any other fate), though he, too, consistently denounces bourgeois subjectivity. Rather, he stresses the “irreducible dimensions of intersubjectivity and culture, however superficial” as a source of excess and plurality. Consequently, for Sterne there can be no mass or universal listening subject defined by “hearing as such,” because it is a radically contingent social construct (MP3 58). In spite of his insistence on intersubjective plurality, however, his analysis remains staunchly critical and broad in scope. “Perceptual technics” amounts to nothing more nor less than “the specific economization of definition [bandwidth, in analog terms] through the study of perception in the pursuit of surplus value,” the generation of surplus and its transduction into capital (MP3 51-3). It is an unsurprising conclusion, perhaps, but in comparison with other proposed economies of digital mediation (such as can be found in theories of “prosumption” and “produsage”), Sterne’s explication provides a nondeterministic and outstandingly useful vocabulary for describing the way in which “perceptual technics monetizes the flow of media in terms of a measured, estimated, and modeled perceptual capacity” (52). Unlike many theorists, Sterne wisely avoids “dilut[ing] the term labor to meaninglessness” by, for instance, uniting all economically ambivalent media practices under the aegis of “immaterial labor” (51; cf. Brennan). Perceptual capital is merely another, very specific and heretofore ambiguous, form of capital; the fundamental process of capitalism remains unchanged (MP3 48-49). However, despite the lucidity of the basic argument, Sterne occasionally invokes terminology associated with controversial theoretical vicissitudes on affective and cognitive labor, such as “the general intellect,” yet neglects to situate his readings of them by providing explanation and justification (49); the result is somewhat mystifying. Thus, the most significant issue in perceptual capital the redistribution of wealth and power made possible by accelerated value extraction, receives inadequate attention. More specific information on the extent to which data compression translates into surplus value might help to clarify the magnitude of this particular form of uneven exchange, thereby facilitating an evaluation of its effective importance as a form of exploitation. In addition, a discussion of the important qualitative differences between this and other forms of exploitation, such as those shaping lives in manufacturing and agrarian economies in so-called developing nations, would then become possible. By rereading Jacques Attali’s Noise in association with perceptual capital and cybernetics, Sterne discovers renewed relevance in a text long understood as canonical in sound studies, and in doing so, he inherits a productively ambiguous hermeneutics. 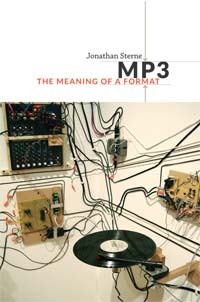 Extending Attali’s argument, Sterne hears music, in this case mediated digitally and contained by the MP3 format for circulation, as an indeterminate harbinger of socioeconomic change. One of Sterne’s most provocative moves is to generalize the principle of perceptual capital according to the mercurial figure-ground relationship between music (signal, in the context of perceptual technics) and noise theorized by Attali in the mid-1980s (MP3 122). While Attali used cybernetic jargon ironically in his critique of instrumentalized society, he nevertheless theorized music—even in this context—as a form that “signified order, but also…prefigured subversion” (Noise 3-4). Sterne obscures the oppositional portion of Attali’s stance even further, perhaps in light of the latter’s influential and controversial role in economic and cultural policy in France, the EU, and the world. As a socialist official, Attali advocated a degree of order, but only to an extent designed to ensure freedom of cultural expression. He saw music as “an immaterial pleasure turned commodity” and therefore emblematic of modern capitalism and social reification—greyness and repetition (Noise 4-5). At the same time, Attali hailed noise as an antidote to the rationalization of music and social production in general to the profit motive (Noise 3). In other words, Attali’s historicization reveals music as increasingly subverted by noise, those sounds deemed socially undesirable by the ruling regime. The result is that order or music is supplanted by an increasingly ambiguous “exchange of signs” to be read as a “mutation [that] forecasts a change in social relations” (Noise 4). One of the sources of Sterne’s ambiguity, then, lies in Attali’s own layered ambivalence: “For Attali, noise was a threat to order, but also a force for change” (MP3 122). Simply put, Sterne and Attali view noise as an exemplification of struggle. Thus, Attali advocated that music and sound discourse should become noise-like in practice and in theory (5). Sterne, however, proffers a symptomatic and Foucauldian reading in which “Attali’s treatise posited the control of noise as a metaphor for all social control precisely at the moment when communication engineers began to articulate a paradigm where noise no longer needed to be eliminated or reduced if it could simply be rendered imperceptible to the ear” (124). Specifically, noise was vanquished by co-optation through perceptual technics derived partly from cybernetics, such as the use of masking techniques in perceptual coding. At this point in his analysis, Sterne makes no conjecture as to whether this shift renders resistance pointless in the face of increasingly subtle forms of subsumption under capital. Rather, he suspends prescription until the last two chapters of MP3. Since the analog era in which Attali wrote Noise, numerous other theorists from a variety of fields and disciplines have attempted to elucidate the dynamic and contingent nature of value extraction as it coevolves with digital mediation, an endeavor Sterne amplifies in MP3 while also situating it within a tradition of critical sound studies. Frequently, emerging musical practices surrounding new audio technologies have attracted scholarly attention as early indications of large-scale socioeconomic changes complicating the boundary between production and consumption. Lisa Gitelman, for instance, has identified hybrid economic forms in the agency of female users during the early developmental history of phonography (Gitelman 15-16, 60-62). In addition, as Sterne notes, Paul Théberge has discovered a blend of production and consumption facilitated by the computer and communications industries’ influence on musical practices during the early development of digital musical instruments (Théberge 37-38, Sterne 203). According to Sterne, contemporary noise is not “composition,” as Attali called it, but rather an even more oppositional method of “decomposition,” which nevertheless possesses a “managerial streak”—that is, a tendency toward instrumentality (125-26). Sterne proposes that new socioeconomic understandings and practices are not just emerging, but also needed. Therefore, MP3 culminates in a proposal that plurality be protected through regulation, at the level of format design if not official policy (240-44). Like other contemporaneous theorists providing an economic contextualization of online phenomena, such as user-generated content on social media sites, he emphasizes the function of demonetization in attenuating the role of exchange value while maintaining or even enhancing the importance of use value (212). Questioning both optimistic and pessimistic technological and economic determinisms, Sterne suggests that this social shift may lead to a panoply of empowering possibilities rather than inevitably toward crisis; at the very least, such potential is "available for discussion" (226). While Sterne’s well-considered critiques are sometimes bundled together with less measured arguments, such as his essentializing dismissals of academic music and the lacunae where readers might expect to find analyses of the plight of music workers, the importance of this book for critical sound studies is undeniable. Furthermore, by bringing diverse theories and disciplines together, Sterne produces a dense and rugged texture demanding manifold and often elite theoretical and technical literacies; inevitably, some readers will hear only clashing dissonances. And despite Sterne’s efforts to explicate concepts and processes in lay terminology, non-academic readers may feel excluded. At the same time, playful visual design elements, clever and perfectly timed comic relief, and a warm and conversational tone provide counterpoint to the gravity and detail of the critique; while readers in various quarters will find this refreshing, it may also provoke resistance in conservatively trained audiences. Nonetheless, while not every stakeholder in the areas comprising critical sound studies will enjoy Sterne’s challenging and occasionally hyberbolic—even noisy—style, by the end of the book the interested reader will recognize it as integral to a committed demonstration of political praxis. Attali, Jacques. Noise: The Political Economy of Music. Trans. Brian Massumi. Minneapolis: University of Minnesota Press, 1985. Print. Brennan, Timothy. “Intellectual Labor.” The South Atlantic Quarterly 108.2 (2009): 395-416. Print. Gitelman, Lisa. Always Already New: Media, History, and the Data of Culture. Cambridge: MIT Press, 2006. Print. Sterne, Jonathan. The Audible Past: Cultural Origins of Sound Reproduction. Durham: Duke University Press, 2003. Print. —. “Bourdieu, Technique and Technology.” Cultural Studies 17.3-4 (2003): 367-89. Print. —, ed. The Sound Studies Reader. New York: Routledge, 2012. Print. Théberge, Paul. Any Sound You Can Imagine: Making Music/Consuming Technology. Hanover: Wesleyan University Press, 1997. Print.